Estas buscando las mejores clases de inglés en Los Ángeles? Looking for the best English classes Los Angeles has to offer? You are in the right place. Spoken by over 380 million people worldwide, the English language continues to grow into its role as the primary international language. When a contract is emailed between India and Norway it is in English. When a Japanese tourist needs directions in Rome they are asked in English. Improving your English with Strommen can help you to meet new people, open new doors, and achieve new career goals. Accent Reduction is also offered to those students seeking to correct ingrained pronunciation mistakes through a systematic approach. Please take a look at our Accent Reduction department for more information. 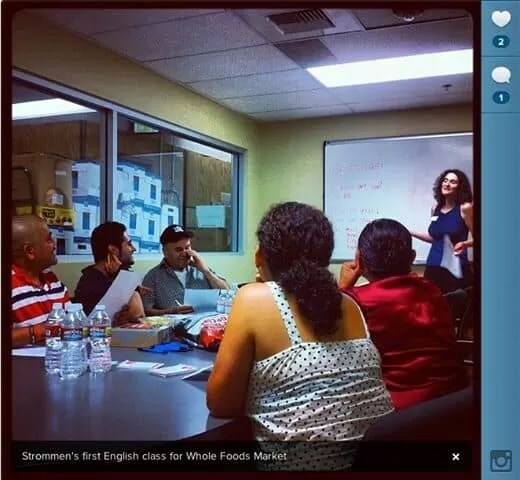 Strommen creates unique English classes in Los Angeles for companies like Whole Foods, Non profit organizations, celebrities and fantastic students like you. At Strommen each student is unique, therefore each class is unique. Our certified English teachers also speak other languages so they can explain concepts in ways that you will understand and remember. You will achieve your goals with a Strommen English teacher. See what makes us the highest rated English classes Los Angeles has to offer. With a Strommen teacher you will speak English on the first class. We think it is harder for you to learn English in a normal group class. Most ESL schools teach classes with 20+ students that don’t speak English. A private session is more effective, efficient and convenient than enrolling in a group class. We equate 10 hours of private classes with a full semester in a traditional college or group class. Scheduling is convenient (7 days a week, any time of day), and you can start right away. How about tomorrow? You can easily reschedule, so you will never miss a class and get left behind. In a private class, you do the speaking. There are no other students to hide behind or take up all of the teacher’s time. Your teacher will make sure you progress at your pace, rather than the pace of the best (or worst) student in the class. Strommen further enriches your learning experience with free podcasts, videos, online resources, Strommen Language Meetups around LA, and group classes. Getting started is easy, just fill out a student application or call us and we will get in touch with you to help choose the best teacher for you. We help you to decide on a teacher based on a number of criteria including our professional gut feeling! We will make sure it is the perfect match. As a student, your Strommen teacher will be highly dedicated to you, but if they happen to go out of town or you feel like switching, rest assured that with Strommen you can always get a substitute or alternate teacher. The locations for our private classes are very convenient (believe it or not we probably have a location down the street). Many of our teachers meet at cafes, at their home office, or anywhere you like. When studying English with strommen, students are able to take class in a full immersion environment. You can even take field trips to different locations (museums, cafes, stores etc.) to create a fun and unique experience based on your interests and to practice your skills in a real-world environment. Strommen Group Classes are a fun, social, and an even more affordable alternative to our private classes. Companies like Whole Foods Market and many more trust Strommen to create custom learning environments and ESL curriculum. We organize traditional classes like “Beginner English” as well as Workshops like “Business English” that start as low as $220 for a 12 hour course. Our classes meet at immersion locations or at your home or office. For information on a custom ESL class please fill out our application and we will be in touch within 24 hours. For a list of our scheduled group classes and enrollment info head over to our Group Class Schedule. Arguably, English is also the most expressive and complex language with 200,000 words in common compared to 184,000 for German and 100,000 for French. The Oxford English Dictionary (OED) has 615,000 words (although many are archaic) and if you include technical and scientific terms English has millions and millions of words. Unlike romantic languages that share Latin as a single common root, English started as a mixture of dialects brought over by Germanic invaders. In the middle ages, it was influenced by Scandanavian and French, and in the renaissance by German, Dutch, Latin and ancient Greek. Consider the difference between “Pork” and “Pig,” Beef” and “Cow”, “Poultry” and “Chicken.” Poultry comes from the French nobility (who did the eating) whereas chicken comes from Germanic farmers. Browse all of our teachers for English Classes Los Angeles below. Don’t live in Los Angeles? No problem, you can meet your teacher online!